Sounds like a dirty word that shouldn’t be on a kid’s design website doesn’t it? Well guess what? It’s not. It actually describes a form of pattern that can make you smarter! Tessellation describes a design pattern made by repeating a single shape on a surface without any overlapping or gaps. And believe it or not, it stimulates the part of the brain where there is a high level of problem solving. You think I’m saying that if you have patterns like this in front of your kids that it helps with critical thinking. Oh I’m not “just sayin” as my kids would say, I’m declaring. I’m going out on a limb on this one. Patterns like houndstooth, jigsaw puzzles, honeycombs; they all are forms of tessellation. They are really a form of math. Still don’t believe me? Read it for yourself. If you spent any time in a department store in the fall of 2011, you would have noticed that fashion had been swallowed by houndstooth. I loved it. Houndstooth encompasses so much energy and versatility! It’s viewed by some to be a bit hoity-toity, by others very professional and sophisticated, and by some maybe even a bit tacky. You know what houndstooth never is? Boring! So, I used it as a core design element for a teenage girl’s room. 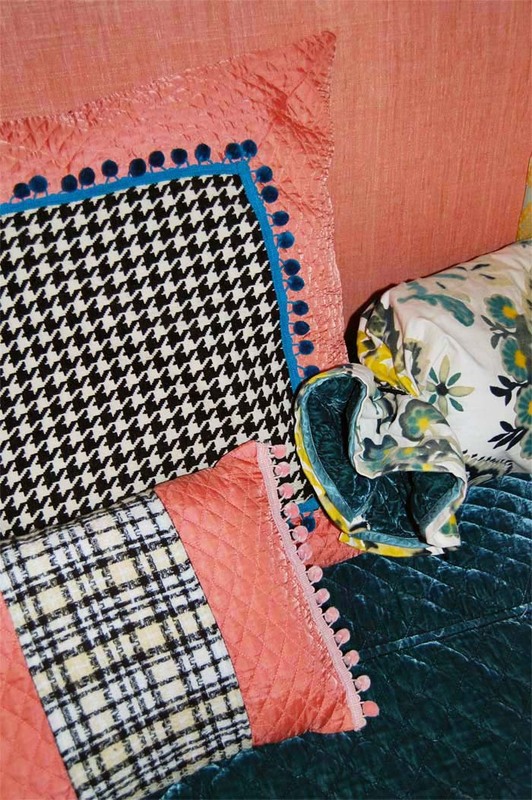 For some custom-made pillows, I combined it with some coral colored quilting and turquoise pompoms. I’m sure you’ve seen these simple IKEA benches. They are extremely sturdy and petite. We spiced them up with new washable slip covers. Plus it added a punch to the rich deep ultramarine paint we used on this desk. Finally, we pulled in a cousin of the houndstooth, the checker, in a knob from Anthropologie. 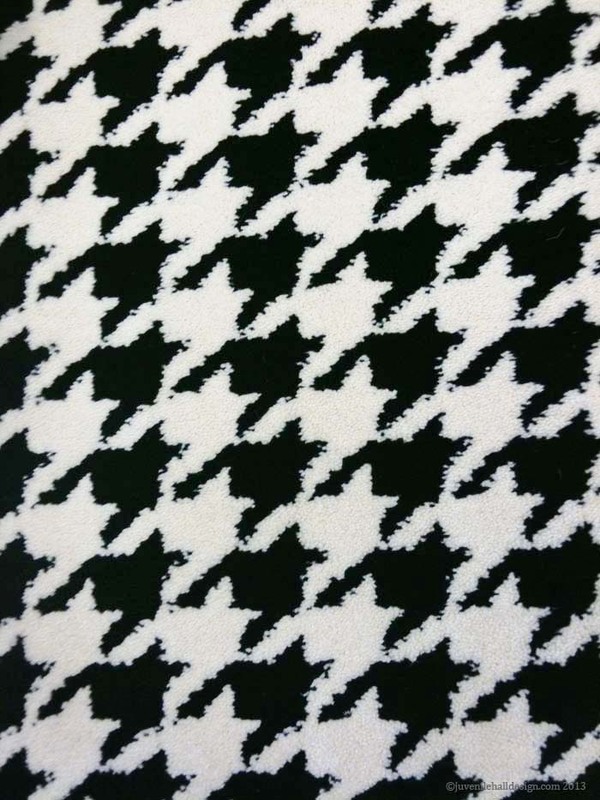 And this…Oh my get ready for this one…this is houndstooth carpet. I found this while I was sourcing materials. But the practical part of me could not put this pristine (and pricey) a surface below the hands that would hold purple sharpies, pink lip-gloss, and strawberry fruit leathers. Still, I had to share with you that this does exist, just in case you want to treat yourself to a little something. Any good houndstooth going on in your kid’s or family rooms? Send the pictures. You know I love them. ...wait!!! This is a last minute surprise add-on. This weekend, I celebrated a birthday. My daughter surprised me with this hand-made, mini-houndstooth owl pillow. Oh my god. I... I can't even begin...there are no words... Now I'm a mess.